The Pirelli CINTURATO P7 Blue is a premium quality touring tyre designed for medium and large sized passenger cars. This summer tyre offers an unconventional combination of wet performance and rolling resistance apart from providing high mileage. These tyres come with wide circumferential grooves that will not only offer great safety and control, but also reduces aquaplaning risk. The shoulder blocks of this summer tyres are enhanced to offer great pleasure during long journeys and great control of the vehicle at corners. The grooves and the sipes are designed in such a way that you get great traction and control on wet and dry roads. The silica tread compounds used are highly innovative and therefore you can enjoy safer driving. The Pirelli CINTURATO P7 Blue tyre that suits 16 inch wheels are: 205/55 91V, 205/60 92V and H, 215/55 97W and 93W and 225/55 95V and 99W. The tyre specs for the 17 inch wheels that you will find in the Tirendo.co.uk store are: 205/50 93W, 215/50 95W, 215/55 98W, 225/45 91Y and V 225/50 98Y, 235/45 94Y and 97W and 245/45 99Y. 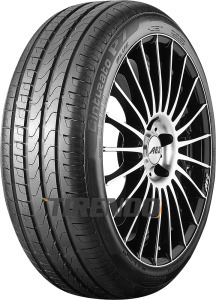 The tyre specifications that suit 18 inch wheel sizes are: 225/40 92W, 235/40 95Y and 245/40 97Y. All the tyre specs mentioned here are read as tyre width/height and load speed index rating respectively.